The new official series name for my currents books is Stories of Clandestina. All of the series’ sub-series/mini-series/arcs that happen in Clandestina will be part of it. I’ve actually had this on the Amazon page for a while, but had it alongside ‘The Larkspur Series’ as well, essentially giving it two series names. Amazon contacted me recently about how this could be a problem and to pick one. So I did. But I also needed to show people that, while they should be read in order, there are different ‘parts’ to the series. Arcs, sub-series, etc. Using the term ‘series’ again only made it confusing (hence Amazon contacting me). So from now on it’s going to be The Larkspur Quartet that follows Pierre and Lizzy’s earlier adventures in Piques. It shows a sub-section to the series and easily tells you how many books there are in the section. I decided to go with an overall Series name instead of letting the arcs be their own series because, as a reader, I have read books out of order before. And it’s annoying. Many authors have multiple series in one world and they tend to have a ‘preferred reading order’ but unless you go on the author’s website you won’t find it. Tamora Pierce has many great books set in Tortall. They tend to be series split based on the main character. Alanna has her books, then Daine, then Kel, etc. I read Daine’s books before I read Alanna’s. I did not know the two went together, or that Alanna’s story was ‘first.’ There was little indication of that. So I had some of Alanna’s story spoiled for me because of references made in Daine’s books to a previous series. I’d rather this not happen to my readers unless I purposefully write something out of chronological order. First of all: The Larkspur Series. The first book is called Larkspur. This is a flower that’s both poisonous when consumed and has several meanings in the Language of Flowers. These range from ‘First Love’ (purple), to being fickle (pink). It has also been used in the past to ward off ghosts and other supernatural things. I loved the many meanings and how they related to each other and the realm of Clandestina. I first came across it when I was looking for poisons that Pierre would have also been looking to use. It is also July’s birthflower (like a birthstone, but, well, a flower) and Lizzy was born in my world’s ‘July’ – Iovilios. I had a series title in mind, The Courting of Life and Death, but it did not feel as natural. I actually released Larkspur with this as the series title, but changed it soon after. I took the ‘Twilight” and “Game of Thrones” approach and named the series after the first title. (I know the series title is A Song of Ice and Fire, but most people are going to call it ‘Game of Thrones’ nowadays. Which is exactly what I wanted to avoid). Thus started my ‘one word title’ trend for the books of Clandestina. To make the title a little clearer, though, I was advised to use a subtitle, and so I went with the slightly older fashion of adding “or” and a short description of the work as an EitherOrTitle (TV tropes link!). In the end it was Larkspur, or A Necromancer’s Romance. 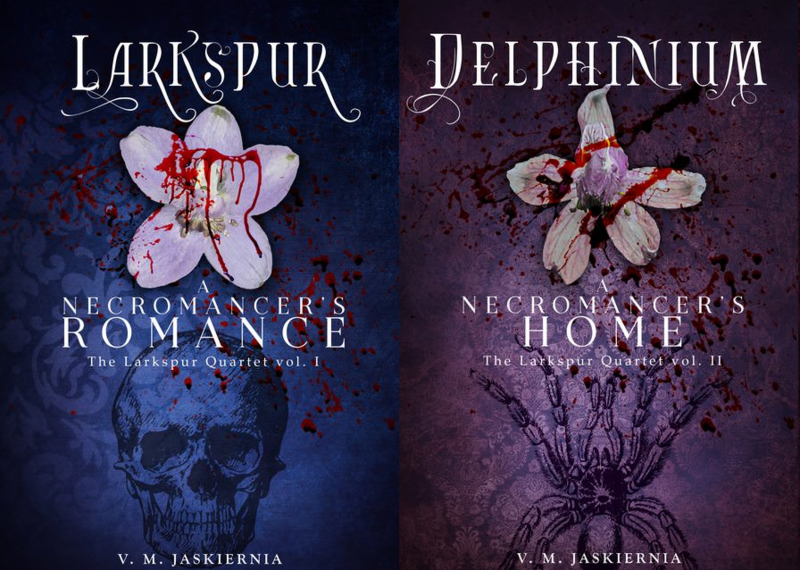 Here with go with book 2- Delphinium, or A Necromancer’s Home. Again it relates to flowers. The same flower, actually. Larkspur is the common name for the flower, and Delphinium is the genus. To me that means it was larger, more specific, more encompassing. Fitting for a sequel. A Necromancer’s Home was also Necromancer’s Love at first, before the story expanded and was about much more than just Pierre and Lizzy. (Originally Delphinium was named Spadille, after the capital city in Piques. Spadille, of course, is another name for the Ace of Spades, known as the card of Death). Book 3 continues on with this: Aconitella, or A Necromancer’s Wife. Aconitella is another scientific name, this time it is a subgenus of Delphinium. Now that we’ve had the common name and the more encompassing genus, we get back to things that are more, say, concentrated. There is not much known about this very subgenus, but the name caught my attention. It seems to be similar to the name Aconitum, wolf’s bane/monkshood, a cousin of the Larkspur, and so I assume the name is taken from the same place, the Greek akónītos, “without dust, without struggle.” It is named such because once poisoned you did not have the time to struggle and simply fell down dead. You may not even have realized that you were dying before it’s too late. I liked this idea of falling into danger without realizing it, almost peacefully dying without a struggle because you were captured so thoroughly. In this book Lizzy and Pierre marry at the very start, and Elizabeth finds herself in the middle of something that she was not aware of entirely before. It is one thing to be a friend, or even someone courting a man who loves death, but to be his wife may be to find yourself in too deep. Book 4, Consolida, or A Necromancer’s Love, involves another subgenus. Consolida. To consolidate is to come together, or to secure something. It also reminded me of console, to help someone work through pain or grief. It felt like a nice fitting end to everything that has been done throughout the series. The subtitle A Necromancer’s Love evens it out- because this love, which was at first only death itself, has become so much more throughout the years that this series will cover. Writing is going well overall. A few beta readers have started to read and comment on part 1 of Delphinium’s beta. Mostly it’s small grammar errors so I’m relieved (thought it would be ripped to shreds). I’ve been slacking some on writing part 2, but mostly I’m still happy to have the first part done. Also I am absolute pants at commas. When I do find myself working on part 2 there’s a lot more cutting and moving around than I had thought. Even if I do write I end up with less words then when I started, so that’s a bummer. Kinda glad I didn’t make a hard deadline. I don’t know if it’ll be done by September 12th, but whenever I do finish it, then I will make a real pre-order and let my betas at it. It should still be done this year though, just maybe not by Halloween. I’m not letting myself fall back off the wagon though. Thankfully the scenes that didn’t work or make sense there did make sense in book 3, so I have a head-start there and the writing isn’t going into a trash pile. … I may have to do one last edit of Delphinium as a whole once the second beta is done. Read it all the way through by myself. If I want fresher eyes I may need to wait a few days or a week to do this. (I did have Larkspur kinda-edited, but it was way shorter, and I did not really need to mess with the draft too much overall. This is oh, seven-ish times as long, and way more complicated. So something changed in chapter 3 needs me to then edit chapters 7, 8 and 25). And here’s some small tidbits. Aconitella, book 3, is plotted for a year and a half. Consolida, book 4, will be three years. The first book in the second series in Clandestina (The Quadrille Series) is plotted for 10 years. Books 2, 3, and 4 in that set are a bit shorter, taking place over almost 4, 5, and a bit over 5 years respectfully. The *third* series has books that span 5 years, 7 and a half, almost 12, and almost 6 years. The 4th series has not yet been entirely plotted time-wise (just book 1, which will be almost 5 years), but will likely also take place over 20ish years. So that’s a 90 year span, give or take. There is a 5th series that takes place before The Larkspur Series and involves Pierre’s père, Félicien, and his life, so if I’m adding that in, it’ll be a 175 years (he does live in Faery for 60 years after all). Plus the dozens of other realms I have where I just know the name, maybe a small spark of an idea, and limitless possibilities. I think I just inspired the hell out of myself. This is 14 years of daydreaming, plotting, planning, working. Half my life has been spent on this world. Now I want, need, to spend the rest of my life writing it all out. It would be my greatest wish and pleasure to do successfully and for you all to happily enjoy. Chapters 1-14, the first 40% or so of Delphinium, has been sent to my betas!!! Part II of Delphinium will aim to be ~70,000. I have 24 chapters, I like my chapters around 3K. I assume some will go over, others under, and some may combine or cease to exist entirely lowing the wordcount some. But I can decide that’s my end date to get out part 2 to my betas. So, by September 12th, I will try and get chapters 15 – 38 done. That gives me a daily wordcount of … 1015 words (already have 26.3K written). Very doable really. I did 3K today between worrying, procrastinating, and drinking waaay too much caffeine. Then I have the rest of September for that to be beta’d, me to get it back, stick parts 1 and 2 together, and then pick a day in October to release! This is, as the first one was, written in pencil not blood. Much of it depends on said betas, whether my vacation happens, if I get hit by a bus, or how life decides to mess with me again. But it’s possible, and a pretty reasonable goal. So it’s my aim for now. (And yes, I am still under the effects of that lovely lovely caffeine).